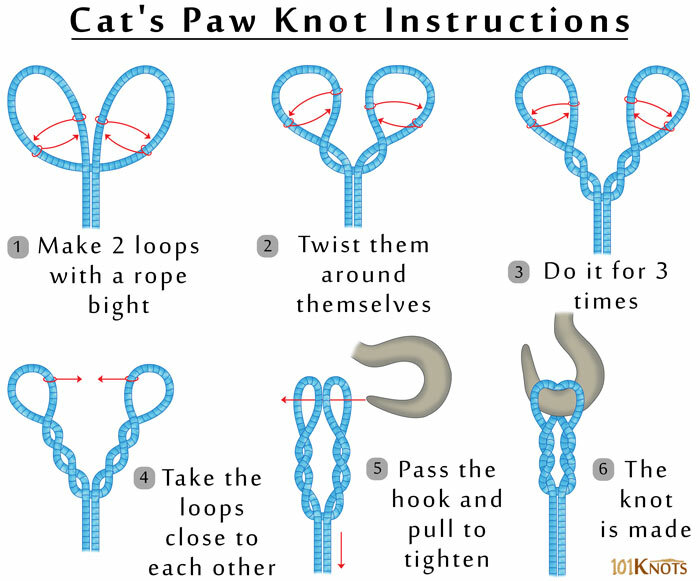 The cat’s paw or offshore swivel knot is used to connect a rope or line to a ring, swivel or hook. The versatile knot is simple to tie and doesn’t jam. It can be used as a sling for lifting heavy loads at any angle. The twisted loops give it good strength and even if one side breaks, the other side will hold temporarily so that the load can be lowered. It finds mention in The Ashley Book of Knots. 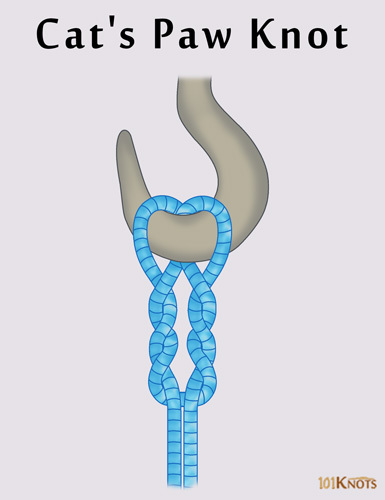 Certain modifications of the knot have additional twists on both the sides of the bight. In fishing monofilament lines it can have as many as 5 turns. You can use a closed strop or a paracord double line instead of the rope bight. Cow hitch – Weaker. Lacks the twists on both the sides of the knot. To lift heavy loads from ships. It is commonly used in docks and wharves. For loop to loop connections in fishing. It can join a braid to a mono leader and braid to braid. It can be used to directly connect to a Bimini twist. In this video, the traditional way of tying the knot and an alternative way to tie the knot when you don’t have access to the ends of the hook is shown.